Rose Mary Knick is at the center of a case the Supreme Court is hearing that stems from her dispute with her town over an ordinance that says landowners who have cemeteries on their properties must make them open to the public during daylight hours. SCOTT TOWNSHIP, Pa. (AP) — Rose Mary Knick makes no bones about it. She doesn’t buy that there are bodies buried on her eastern Pennsylvania farmland, and she doesn’t want people strolling onto her property to visit what her town says is a small cemetery. Six years ago, however, Knick’s town passed an ordinance that requires anyone with a cemetery on their land to open it to the public during the day. The town ordered Knick to comply, threatening a daily fine of $300 to $600 if she didn’t. Knick’s response has been to fight all the way to the U.S. Supreme Court, which heard arguments in her case Wednesday. 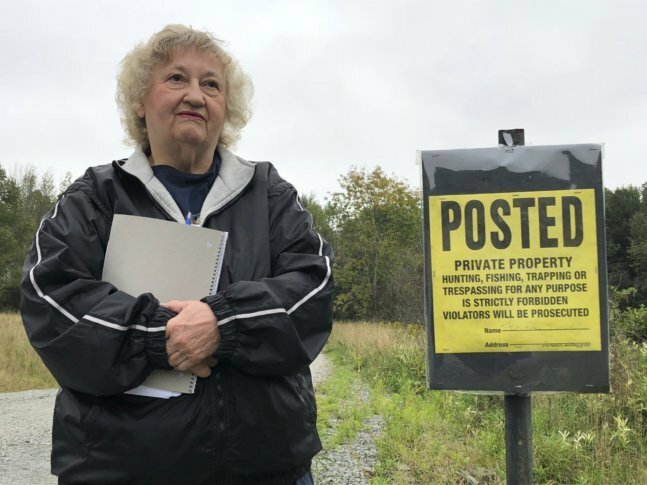 “Would you want somebody roaming around in your backyard?” Knick asked during a recent interview on her Lackawanna County property, which is posted with signs warning against trespassing. Her neighbors in Scott Township, the Vail family, say they just want to visit their ancestors’ graves. The Supreme Court isn’t going to weigh in on whether there’s a cemetery on Knick’s land. Instead, it’s considering whether people with property rights cases like Knick’s can bring their cases to federal court or must go to state court, an issue groups nationwide are interested in. Knick, 69, says her town’s ordinance wouldn’t protect her if people injure themselves on her land and sue. And she says if the town is going to take her private property and open it up to the public, they should pay her. She says she believes that the town was trying to make an example out of her for questioning lawmakers’ decisions. Knick, who has lived on her 90-acre property since 1970 and who did clerical work for a food chain before retiring, says nothing on her property title indicates there is a cemetery on her land. She says she’s never seen any gravestones or other evidence of a cemetery there. Her land, now partly being used to grow pumpkins and gourds, does have some rock fences and several areas where there are rectangular, flat rocks on the ground. She takes a visitor to one such area and says the others are basically like it. “Are they a marker? I have no clue,” she said of the flat stones. But Knick’s neighbor Robert Vail Sr., 85, says Knick knows exactly where there’s a cemetery on her land. Vail’s family has lived in the area since the early 1800s and he says it’s his relatives, at least half a dozen of them, who are buried there. He has a list of them, prepared decades ago by a local historian, and pictures of some gravestones. Vail asked town officials years ago for help getting on to Knick’s land, and they drew up the ordinance that passed in 2012. There’s now also a narrower state law on families’ access to cemeteries that may apply to her, too. Vail says he uncovered his relatives’ gravestones on Knick’s property by getting down on his hands and knees and probing the earth with a screwdriver to find the buried markers. He initially found three and a part of another, most for relatives who died as children, he said. But he says on a later visit the stones were gone. Sitting in his living room, about a five-minute drive from Knick’s home, Vail pointed to books that trace his family tree back hundreds of years. All he wants, he says, is to visit Knick’s land a few times a year to clean up the area where he found the stones, to plant a flag and to pay his respects to relatives that include a Revolutionary War soldier. “There’s nobody else that would have any interest whatsoever,” Vail said, acknowledging there might be curiosity seekers temporarily. Whatever the Supreme Court decides, Knick’s case won’t be over. The question for the high court is limited to whether she can continue her fight in federal court or whether she has to go back to Pennsylvania’s court system, where her case began. A Pennsylvania court initially told her that she’d have to wait to have her claims heard until the township tried to impose the ordinance’s fines. After she turned to the federal court system, an appeals court called the town’s ordinance “extraordinary and constitutionally suspect” but said that Knick couldn’t pursue her case in federal court. A 1985 Supreme Court decision effectively barred people with property rights claims like Knick’s from going to federal court, her lawyers say. Knick wants the Supreme Court to overturn that decision. Christina Martin, one of Knick’s lawyers with the Pacific Legal Foundation, says people generally have a choice about whether to go to federal or state court when they’re arguing that their constitutional rights are violated, but not in cases like Knick’s, which she says is unfair. At Wednesday’s Supreme Court arguments, at least four of the eight justices seemed concerned about the inability of people in Knick’s situation to ever get into federal court, but it also didn’t seem there were the votes to overturn the 1985 decision. After arguments, Knick marveled at how far her case had gone. “I never dreamed in a million years that I’d be at the Supreme Court defending my property rights,” she said.